Deb's Cup of Tea: This would be awesome! It started with the update to the Crafts blog to the right. Curious about a photo I saw, I followed the link and now have 2 more crafty blogs to watch and a fantastic idea that will probably never see the light of day but makes me think about my home space differently. 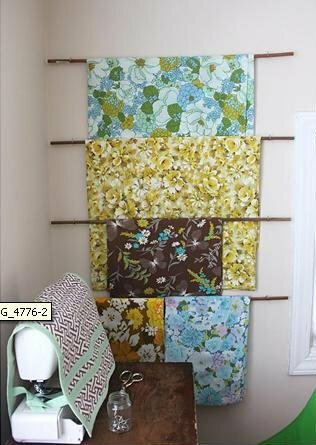 It's called a "Fabric Rack". The complete instructions are here. This is just the neatest thing and so simple to do. I sew in the kitchen because that's where the table is. There isn't room in my home office for the sewing machine unless I get rid of the two bookshelves to the right along the east wall, the wardrobe along the south wall, or the computer desk and cedar chest on the north wall. The west wall has windows. I live in a tiny house and am grateful I have room to store what I have. I should go through my books and make a big box to donate. Wonder if there is anyone collecting books for needy libraries some place? I'd foot the bill to ship them a box of once-reads. Anyway, somewhere on the long list of things to do is to repaint Carole's room to turn it into a reading room guest room. I bought the wall art years ago. I have some great photos, illustrations, art that needs framing for these walls. I have picked out the color of the walls. If I did this idea I'd have to move the litter boxes although I probably could leave them where they are and it would just be a reading room since I really can't afford to buy a daybed which was the original idea. But I see this and think, "There's this 'nook' in the east wall. I could paint the wall behind it cream or ivory and then do this, hanging some of the chunks of fabric I have as art." The chucks could be rotated as I felt like. Maybe that would inspire me to get some of them turned into the projects I bought the fabric for. I'll do this right after I get back from my vacation to Sark.